"The Seven Samurai" remind us that martial-arts, like WAYK, are for protecting community life. Over the past couple years, as we’ve been working to share WAYK with a larger audience, we’ve collected a lot of feedback on how to present the game. On the one hand, the answer is “no”: though signed languages, maintained by fluent deaf signers, offer the most fluid and useful hand signs to act as a bridge language (and simultaneously provide the first step towards speaking with Deafies too), you don’t have to learn a sign language. You can make one up, contracting your own signs to carry the target language. You can also choose not to use signs at all (and sometimes, if your hands are full, you won’t have the choice). 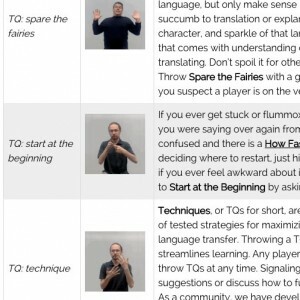 Technique Signing, though massively powerful, is just one of hundreds of techniques that accelerate learning – it is the TPR act of gesturing and mime that accelerates play. We think of WAYK as a mental martial-art. It is comprised of a system of moves and attitudes that look different in the hands of different players, and simple moves at the beginner’s level transform into complex elegance at the expert’s level. Certainly WAYK can be a casual, fun hobby – and this is an important point. It has to be accessible this way, casually, by a whole community, from children to elders, from the learning disabled to the natural linguist. For most people, WAYK can be just simple fun. However, for those inspired by the idea of becoming a language hunter, WAYK opens up a whole other world. For these folks, no amount of time spent training the skills of language hunting is too much – and what they are capable of can seem like magic. At the highest skill level, martial-arts are peace loving tools for creating more life. But it isn’t magic – it is simply the ability to use the simple “moves” of WAYK on the fly, in chaotic situations, adjusted for changing contexts. It is important to note that a major accelerator to becoming a language hunter is simply going for it – drilling the skills without questioning them, without choosing which ones you “think” will work, and which ones you think won’t. Just like in a physical martial-art, WAYK is a product of natural evolution – it wouldn’t be a technique if it didn’t work. You’ll never know if, how, and when a technique works, until you’ve mastered it. No technique works all the time, but all of them exist because they are the “perfect move” for the right context. You never stop learning in WAYK; even experienced language hunters are still exploring new worlds of endeavor, according to their level. Rather than simply mastering the game at the table, language hunters are exploring how to “court” fluent fools, how to set up the most enjoyable conversations, how to design more satisfying immersion weekends for their communities. New techniques are emerging for these contexts all the time. So, does WAYK take a bunch of work? Well, yes, and no. It depends on what inspires you. If you are looking for casual games with friends, than a casual investment is plenty. If you are looking to join the ranks of the language hunters, then there is no telling the amount of time you’ll spend training your skills – and you’ll hardly notice the time go by, because in WAYK, getting there is more fun than arriving. Otherwise, you’re not playing “Where Are Your Keys?”. foot note for the picture: Aikido (合気道, aikidō?) is a Japanese martial art developed by Morihei Ueshiba as a synthesis of his martial studies, philosophy, and religious beliefs. Aikido is often translated as “the Way of unifying (with) life energy” or as “the Way of harmonious spirit.” Ueshiba’s goal was to create an art that practitioners could use to defend themselves while also protecting their attacker from injury ! Tc. We all get there together ! I’m glad you got the Aikido reference, Claude! Morihei Ueshiba and the art of Aikido has been an inspiration for me (and I think Evan too) for a long time. Ueshiba was also an innovator in martial-arts training, developing accelerated training hall techniques such as his school-wide atmosphere of “how fascinating!”-style laughter and joy in training.